On the morning of April 8, 1940. the HMS Glowworm was on her way to rejoin the HMS Renown when she encountered the German destroyers Z11 Bernd von Arnim and Z18 Hans Lüdemann in the heavy fog before 8:00 a.m. 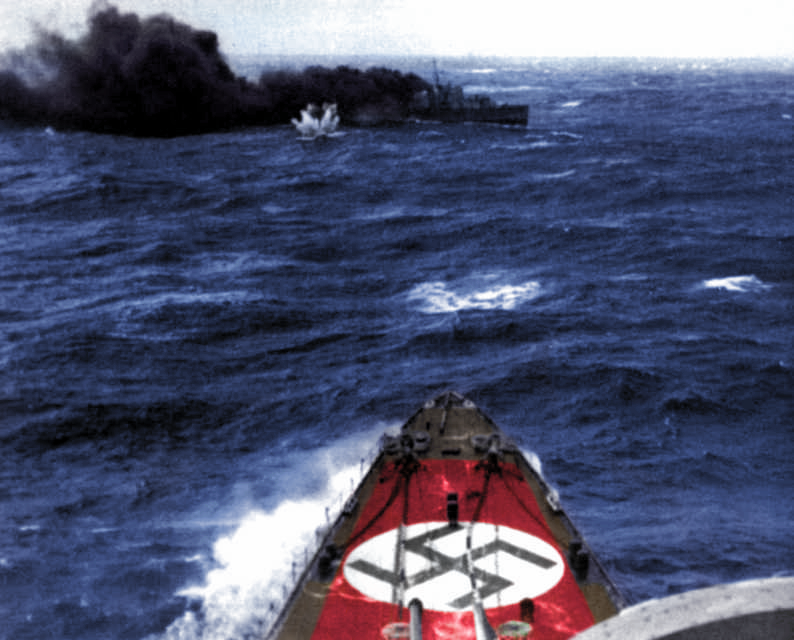 The destroyers were part of a German naval detachment, led by the heavy cruiser Admiral Hipper, on its way to land troops at Trondheim as part of Unternehmen Weserübung. Glowworm opened fire and the German destroyers attempted to disengage, signalling for help. The request was soon answered by Admiral Hipper which spotted Glowworm at 09:50. Hipper initially had difficulty in distinguishing Glowworm from von Arnim, but opened fire eight minutes later at a range of 9,200 yards with her 8.0 inch main guns. Glowworm was hit by Hipper’s fourth salvo and she started making smoke. 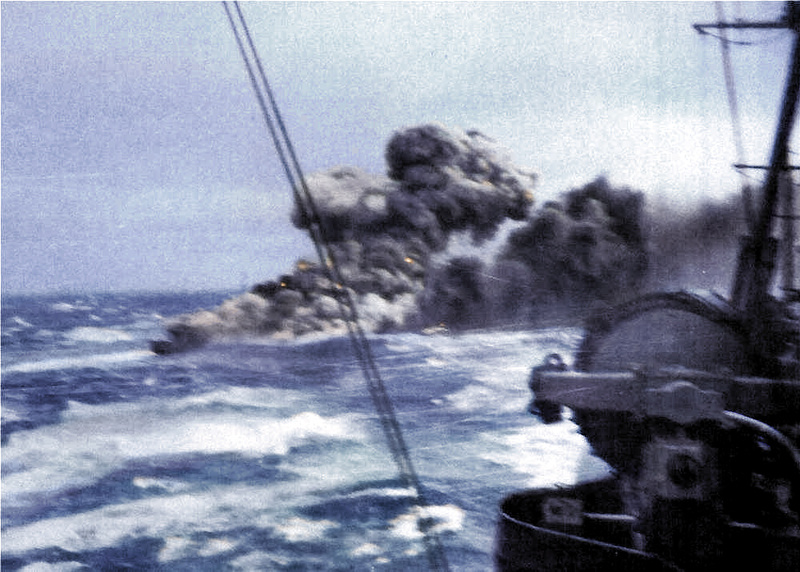 She turned into her own smoke in an attempt to break visual contact with Hipper, but the cruiser’s radar-directed guns were not affected by the smoke. When the destroyer emerged from her smoke the range was now short enough that the cruiser’s 4.1 inch guns could fire. Glowworm’s radio room, bridge, and forward 4.7-inch gun were all destroyed, and she received additional hits in the engine room, the captain’s day cabin, and finally the mast. As this crashed down, it caused a short circuit of the wiring, causing the ship’s siren to start a banshee wail. At 10:10, Lieutenant Commander Gerard Broadmead Roope fired five torpedoes from one mounting at a range of 870 yards, but all missed because Captain Hellmuth Heye had kept Hipper’s bow pointed at Glowworm throughout the battle to minimize his risk from torpedoes. The destroyer fell back through her smoke screen to buy time to get her second torpedo mount working, but Heye followed Glowworm through the smoke to finish her off before she could fire the rest of her torpedoes. The two ships were very close when Hipper emerged from the smoke and Roope ordered a hard turn to starboard to reduce the range and possibly ram the cruiser. Hipper was slow to answer her helm and Glowworm struck the cruiser just abaft the anchor. The collision broke off Glowworm’s bow and the rest of the ship scraped along Hipper’s side, gouging open several holes in the latter’s hull and destroying her forward starboard torpedo mounting. One German sailor was knocked overboard by the collision. Hipper took on some 500 tonnes of water before the leaks could be isolated, but was not seriously damaged. Glowworm was on fire when she drifted clear and her boilers exploded at 10:24, taking 109 of her crew with her. Admiral Hipper hove to in order to rescue her man overboard and Glowworm’s survivors. The German sailor was not found, but 40 British sailors were recovered, although at least six later died of their wounds. Lieutenant Ramsay, the senior surviving officer, told his rescuers that neither the helm nor the emergency rudder were manned when the ships collided so the destroyer’s turn towards Hipper was probably accidental. German accounts only mention four torpedoes fired by Glowworm, but British accounts say all ten were fired. 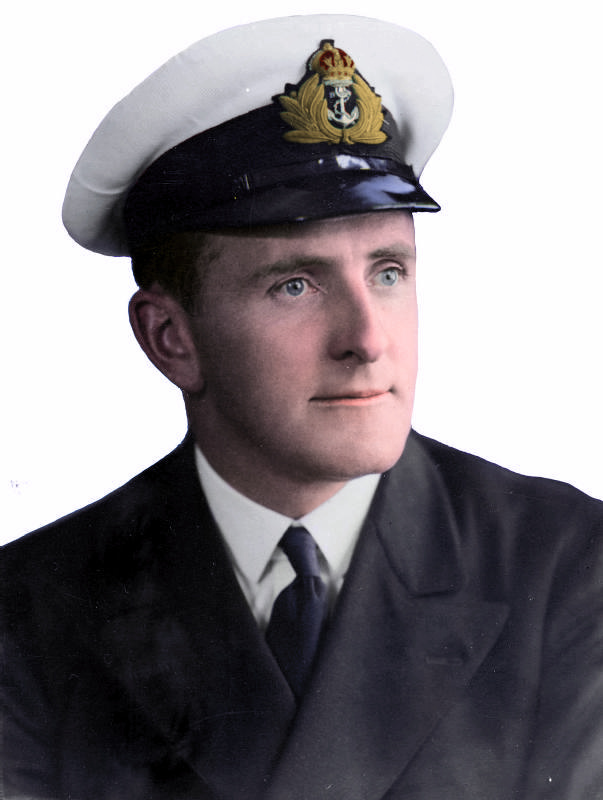 Roope, who drowned when he could no longer hang on to a rope whilst being pulled up the side of the cruiser, was posthumously awarded the Victoria Cross, thus becoming the first VC recipient of World War II. The award was justified, in part, by the recommendation of Heye, who wrote to the British authorities via the Red Cross, giving a statement of the valiant courage Roope had shown when engaging a much superior ship in close battle. I have heard about the Glowworm in passing before but never seen the whole story. Thank you very much for sharing. Oh, thank you. Remember the 109.